The Spiritual Warfare Bible from Charisma House is an NKJV devotional Bible to help strengthen and prepare readers for spiritual battle. 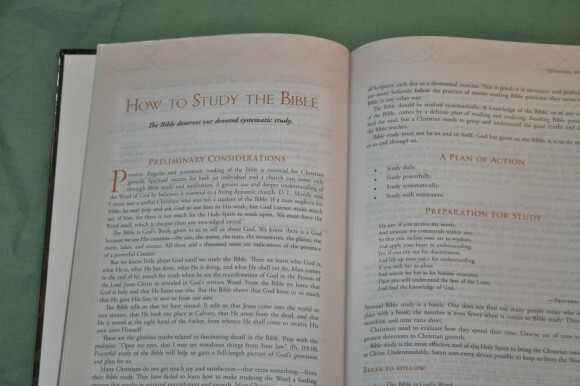 It contains articles and prayers, and even includes some inductive study materials for both personal and group study. This is a glued hard cover edition. It’s black letter with a 9-point font with plenty of space between the lines. The text is two-column paragraph format with large, semi bold verse numbers that are easy to find. 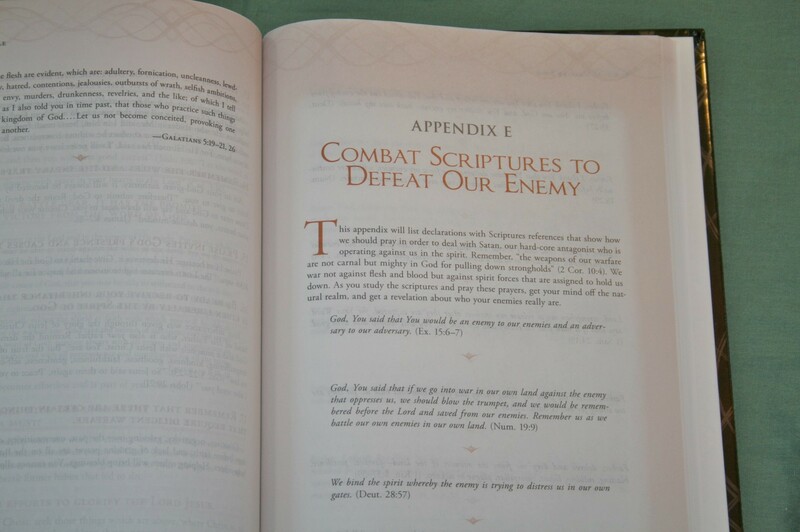 The headings, chapter numbers, and article titles are printed in an orange font that stands apart nicely. 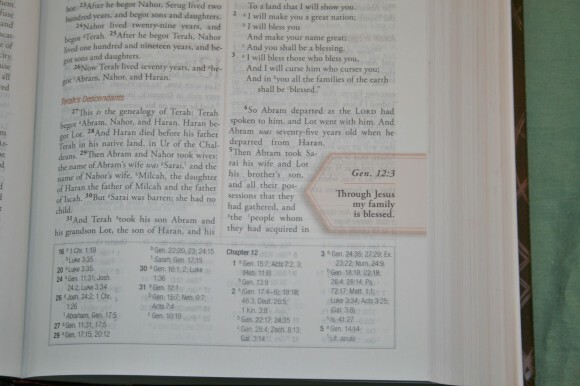 The standard Nelson NKJV references and notes are located at the bottom of the page. 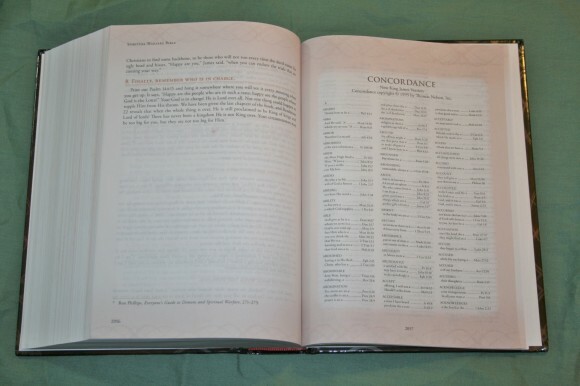 The references and notes are keyed with letters and numbers. The paper is thin. 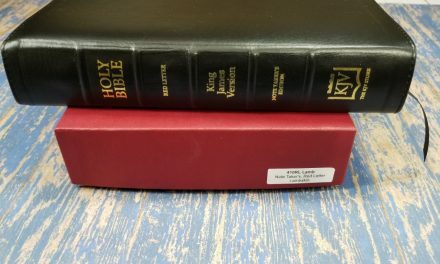 It’s not very opaque, but it is within what is expected in a study Bible of this price-point. 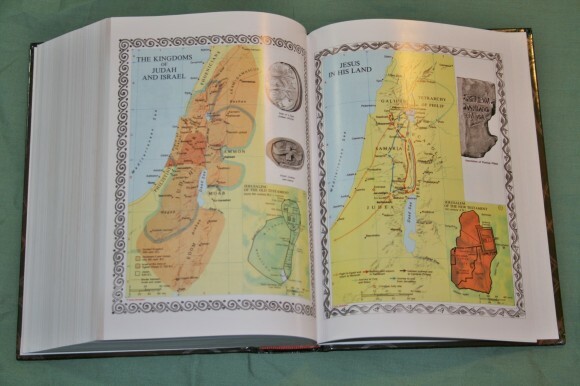 In the back there is a 78-page concordance with three columns per page, and 8 pages of maps. I found it easy to read and use. The print consistency is good throughout. It does have more show-through than I like. The tools are easy to use and very helpful. 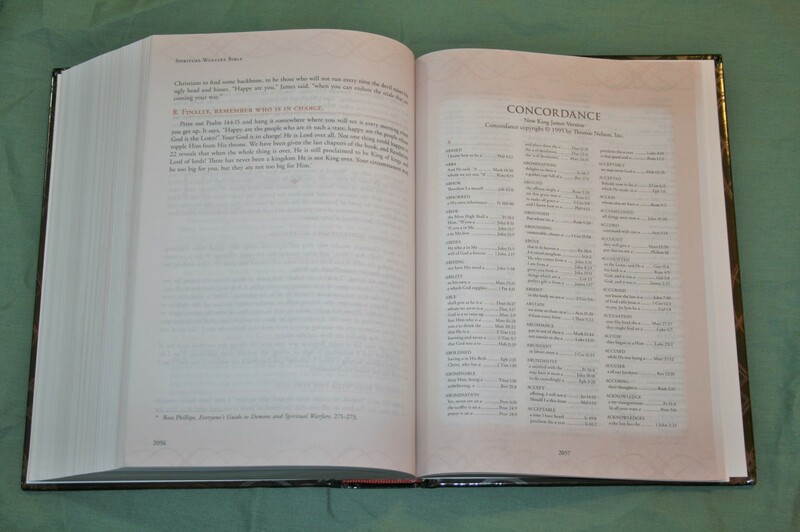 The concordance is the standard NKJV concordance from Nelson. The maps are colorful, but for me they’re too bright. They do have some good archaeological information such as pictures of coins and tablets. 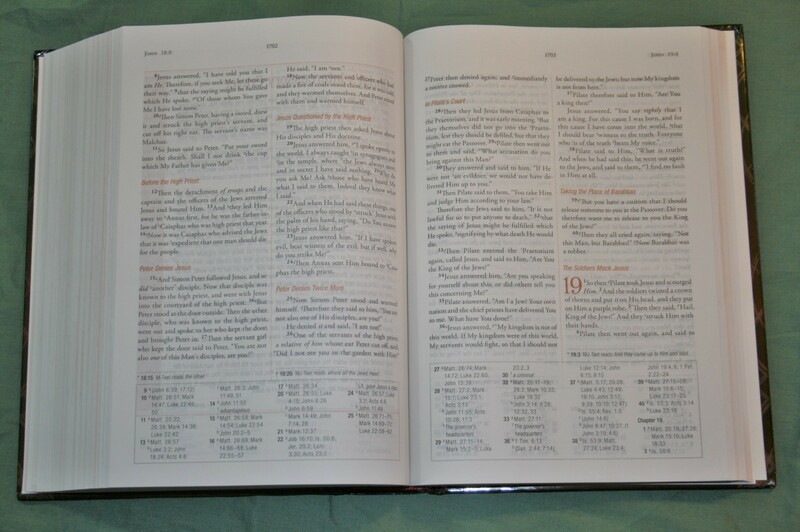 At its core, I would call this a devotional Bible. The focus is of course on Spiritual Warfare, so all of the articles, prayers, and study material are written with this in view. The materials are primarily excerpts from other materials by the publisher. There are book introductions that are titled The Holy Spirit’s Word in (book title). 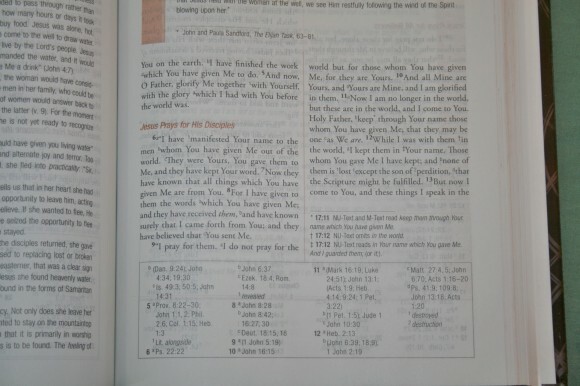 This is about a half a page and talks about the primary situations that those in the book faced and how God helped them through it. 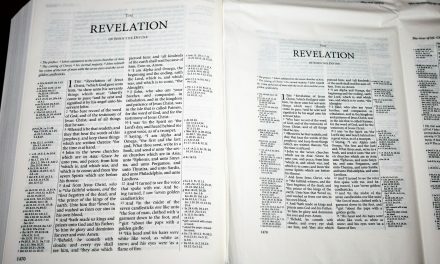 There are 250 Spiritual Warfare Declarations throughout the text. These are one-sentence statements or prayers that include a Scripture reference. 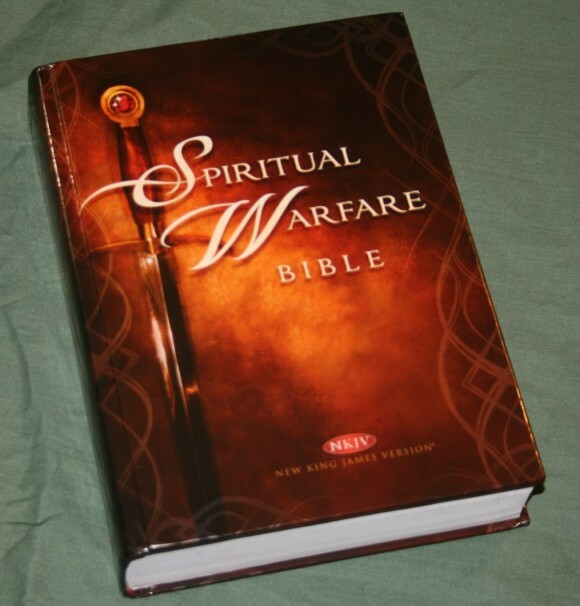 There are 220 Spiritual Warfare Basics. 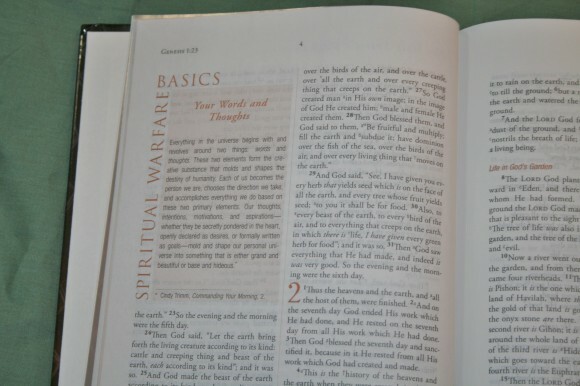 These are about a column long and include tips for spiritual warfare. They are located close to the topic that they correspond to. There are 21 character profiles called Lessons from God’s Warriors. They talk about someone that was anointed for spiritual warfare and lessons from their experience. 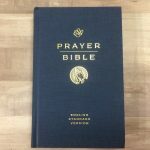 There are several Spiritual Warfare Prayers throughout the Bible to help you in various situations that you might face. 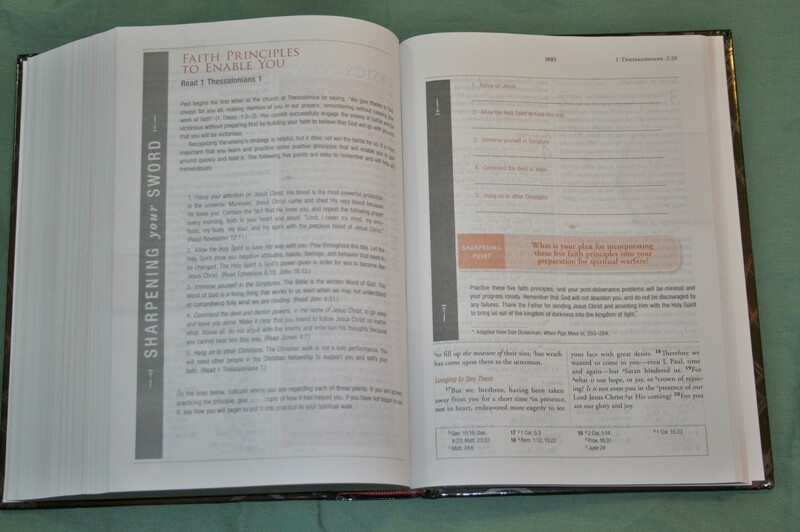 Sharpening Your Sword are studies throughout the Bible that you can use to dig deeper into the topics. They give you questions to answer and a place to write your answers. These are great for personal and group study. Preparing for Spiritual Warfare Articles are 1-2 page long focus articles for each book that focus on a specific passage. 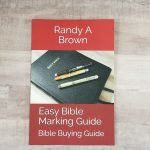 They are great for digging deeper into the topics and for building your faith. 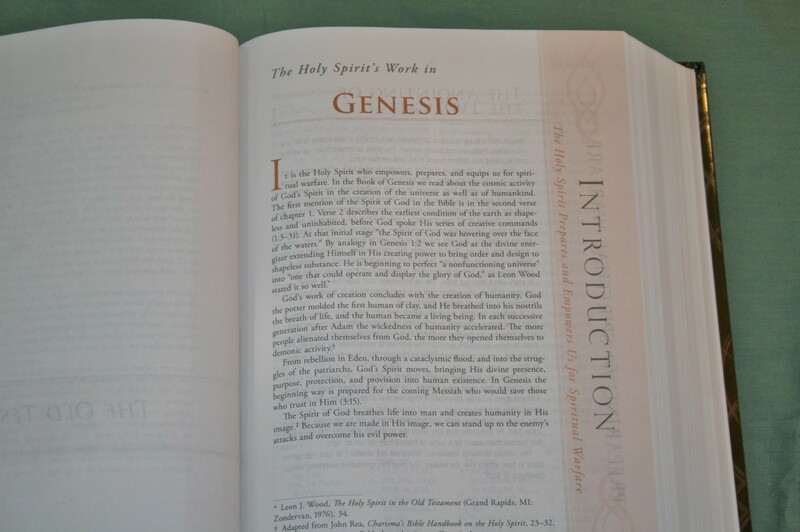 It is this devotional material that sets this Bible apart from the rest. The primary focus on these tools is application. 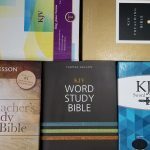 Rather than give you commentary on verses or passages, the articles give you tools for personal growth. Most of the time we tend to think about the physical – what we see and touch. But we are in a daily spiritual battle. 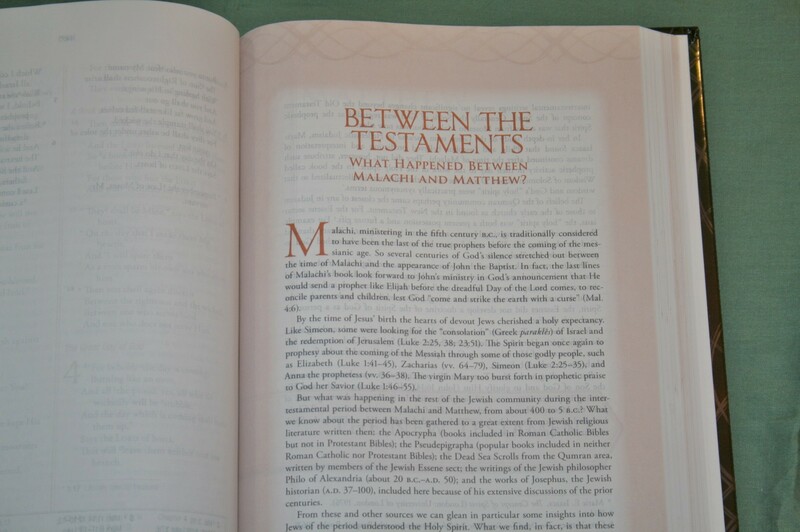 The articles and studies are great for getting you thinking deeper about the things of the spirit. Just keep in mind that there is some theological bias. In my opinion it doesn’t diminish the quality of the teachings. Just be aware of it and do your own study. 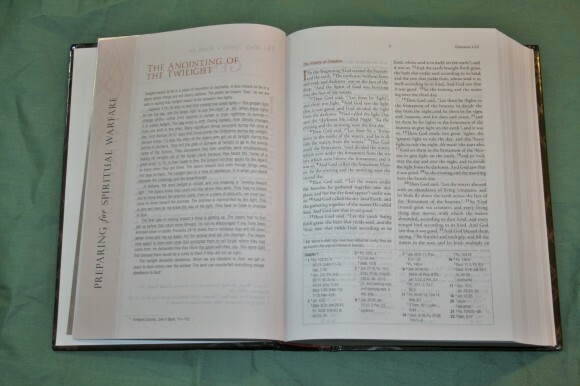 The Spiritual Warfare Bible from Charisma House is a great devotional for personal and group study and can even be used for sermon prep. Charisma House provided this Bible free for review. I was not required to give a positive review – only an honest review.